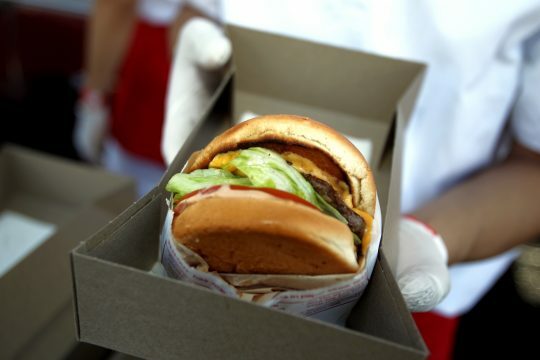 The chairman of the California Democratic Party called for a boycott of regional burger chain In-N-Out Thursday after it was reported the company has donated to the Republican Party. Los Angeles Magazine reported Wednesday that "Your Favorite Burger Chain Just Donated a Bunch of Money to the Republican Party," calling attention to a $25,000 donation the Irvine-based corporation made to the California Republican Party. "It’s certainly not the first In-N-Out Republican contribution… In 2017 and 2016, the company donated $30,000 per year to the California GOP for general party expenses," the report noted. In-N-Out also donated to a pro-business Super PAC run by a centrist Democrat political operative. The next day, California Democratic Party chairman Eric Bauman called for a boycott. "Et tu In-N-Out?" he tweeted. "Tens of thousands of dollars donated to the California Republican Party… it’s time to #BoycottInNOut – let Trump and his cronies support these creeps… perhaps animal style!" In-N-Out Burger is famous for being a local cult-like favorite of Californians and visitors to the Southwest, regularly being voted as either the best or second-best burger chain in the United States. The chain's ownership makes no secret of their Evangelical background, printing Bible verses on wrappers and other products. This entry was posted in Politics and tagged Democratic Party, Republican Party. Bookmark the permalink.